If you set out in search of Theodore Roosevelt’s America, your travels would inevitably lead you to the Black Hills of South Dakota and the monumental image of Roosevelt carved on the face of Mount Rushmore by sculptor Gutzon Borglum. After paying for parking, snapping a picture or two, pondering the faces for a short spell and buying the requisite t-shirt, you may consider your time with Roosevelt in South Dakota to be at an end, but Roosevelt can be found elsewhere in the Hills if you know where to look. In Rapid City, the gateway community to the Black Hills which promotes itself as the City of Presidents, you will find a collection of life size statues depicting each of the nation’s presidents. 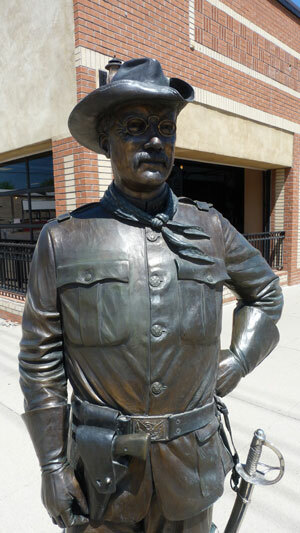 At the intersection of 9th and Main Streets stands John Lopez’s bronze sculpture of Theodore Roosevelt in his Rough Riders uniform (complete with a blue polka dot bandana). Once you have taken your selfie with the Colonel, a closer inspection of your surroundings will reveal that the statue is bracketed by two markedly different drinking establishments that pay homage to the president in their midst. Behind Roosevelt and to the east lies Teddy’s Sports Bar with its bull moose mascot. When my wife and I visited this past May, Teddy’s was advertising an upcoming mixed martial arts fight. One wonders what Roosevelt would think of this especially “manly” and sometimes brutal sport. Across the street and to the west you will find Bully Blends Coffee & Tea Shop. Adorned with Roosevelt pictures and a selection of books by and about Roosevelt, this charming cafe features a Bully Breakfast Combo, Bully Burger, Bully Buffalo Hot Dog and a Bully Brownie (which this author found to be delightful) as well as other Bully menu items. Owners Peter and Aida Compton confess on the back page of their menu that they “really admire” Roosevelt and the prominence TR has in their establishment makes that abundantly clear. Sufficiently caffeinated you will now have the energy to find the other notable Roosevelt monument in the hills northwest of Deadwood, South Dakota. The Roosevelt Friendship Tower, which sits atop—appropriately—Mount Roosevelt, is a 31 foot tall stone masonry tower which at first glance appears as though it is a piece from a gigantic chess set. Built at the insistence of Roosevelt’s good friend and Black Hills legend Seth Bullock, the tower was dedicated on July 4th, 1919 only six months after Roosevelt’s death. Two interpretive panels at the start of the half mile trail from the parking area to the tower tell the story of the tower’s planning and construction and explore the friendship between Bullock and Roosevelt. The tower underwent an extensive renovation in 2010 to repair its aging stone work and to improve its accessibility to the public. Now capped by a metal roof to protect its interior from the elements, visitors can climb the tower stairs and (on clear days) take in views of four states. But your discovery of Roosevelt in the Black Hills is still not at an end as trips to Wind Cave National Park and Jewel Cave National Monument (both established during Roosevelt’s presidency) beckon from the top of the tower. Born and raised in western North Dakota and a member of the Advisory Board of the Theodore Roosevelt Association, Duane Jundt is a Lecturer in History at Northwestern College in Orange City, Iowa. What a delightful article! I can’t wait to look up these places the next time I return to the Hills. 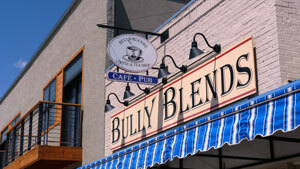 Thanks, Duane, for visiting Bully Blends Coffee & Tea Shop at 908 Main St in Rapid City! We appreciate your kind comments and hope your travels bring you back this way soon!